If you are not yet at your goal health then you too will be running effective strategies at getting the result you do not want. Today’s show – part 5 in the series – is your step by step guide to creating effective strategies… from eating and exercising strategies to motivation and anything (!) strategies. 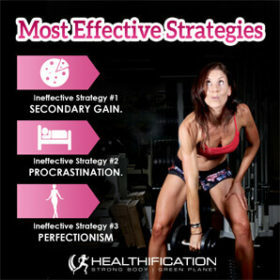 Today we’re covering: Smart Simple Fat Loss: Most Effective Strategies. I covered part 4 in show: #260 Smart Simple Fat Loss: Educate And Accelerate. I covered part 3 in show: #255 Smart Simple Fat Loss: Eliminate Limiting Beliefs. I covered part 2 in show: #250 Smart Simple Fat Loss: Align Your Goal. and part 1 in show: #245 Smart Simple Fat Loss: Define Your Goal. What we’re going to do is break down the stages (each little step that lead on from each other to form a strategy) that you may think ‘just happen’ and understand what isn’t working and then model what is working. And you can model what is working either for you in other areas of your life OR for other people who have the results you’re seeking. Why are we taking the time to get so thorough? Well, an effective strategy at getting the result you don’t want and an effective strategy at getting the result you DO want are going to take the same amount of time and energy… so you might as well go with the one that gives you the pleasing result right? Long term the ability to recognize what is and is not working in the strategies you run will be helpful in every aspect of your life. A) First comes recognition that everything you do is a strategy. It doesn’t just happen. The steps involved may be happening at an unconscious level, however they are happening. B) Next is a willingness to accept 100% RESPONSIBILITY. This is huge. Definitely one of the most important factors to success in body gain and in everything. 100% responsibility = 100% ability and power to change. It means you can accept that the way you are doing something is not working and you can model a way (a strategy) that is. I’ve preciously blogged about eating and exercising strategies and motivation to exercise strategy. The 3 most common strategies to be found with frustrating frequency in any area of your life in which you are STUCK. Your current course of action or inaction gives you something or allows you to avoid something that currently is more important to you than the pleasure you associate with achieving the result you say you want. => it’s more than simply the pleasure of the chocolate cake out-weighing the pain of being the only one declining it and watching as everyone else digs in. Perhaps it’s the pleasure – the possibility – the safety of holding onto your dream as an exciting and inspiring goal rather than the possible pain – the risk – the uncertainty and potential disappointment of giving your goal your very best shot and failing? What is the secret gain you get – the hidden benefit from NOT being your ideal health? To procrastinate is to indulge in lazy thinking. An unwillingness to accept responsibility and decide what is the next best step. A focus on the pain involved in a given task rather than the pleasure involved in the results doing that task will give you. => the procrastinator will prioritise the unimportant by giving time and energy to the things that are easy, familiar and safe at the expense of those things that get a result. Perhaps its getting entrenched in Face-book or doing house-work in your prime fresh-brain-and-body-early-morning-time instead of just chucking your work-out gear on and getting yourself out the door before your brain even gets the chance to compute and reason and rationalise WHY the pain of exercising is more than you can face right now. When do you procrastinate (and reason yourself right out of results) by focusing on the pain of a task rather than the pleasure of the results that task will give you? Although you may believe to be a perfectionist is to have high standards, it is in contrast to have no standards. To set the bar so high – you do nothing. It’s the perfect excuse to do nothing. 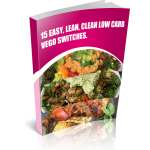 => it’s looking around for the perfect program, or the perfect nutrition plan. It’s waiting for the perfect time to start… and too often just not starting. The perfectionist can be all or nothing. However all or nothing does not let you keep your results. In fact the average program followed consistently will always outperform the perfect program followed haphazardly. Where are you waiting for perfect before making a start – how long have you been waiting – and how exactly is that strategy working for you? Let’s make this example apply to Procrastination. Step 1) How do you ‘do’ procrastination? I think about EVERYTHING I need to do. I feel overwhelmed as to where to start and what is most important… and daunted by the fact that I can’t possibly get it all done. I start to fixate on the details of one task, and then another, and then another… bouncing from one to the next and back. It is all important and everything requires too much energy – I can’t decide. I find myself mindlessly doing something unimportant, familiar and safe that requires zero thought. Ok, we know what doesn’t work. So, what does? => The best thing to do is to ‘elicit’ your own strategy. It’s easy. I’ll walk you through it right now! I’m wondering can you remember a time when you felt totally focused? Can you recall a specific time….and as you go back to that time now – what was the very first thing that caused you to feel totally focused? Was it something you saw – or the way somebody looked at you? Was it something you heard or what someone said to you and their tone of voice? Was it the touch of something or someone? What was the very first thing that caused you to be totally and absolutely focused? And after you saw heard or felt that – what was the very next thing that happened as you were totally and completely focused…did you picture something in your mind – say something to yourself – have a certain emotion or feeling, what was the next thing that happened as you were totally focused. After you saw, heard or felt that, did you then know that you were totally focused or did you picture something else in your mind, hear something else or feel a certain way as you were absolutely focused? => Make a note of each step – because strategies are cross-contextual, once you have this effective strategy you can use the same process for any strategy. Tell myself how important (creating a business I love and am proud of is) is to my core identity beliefs, values and happiness. Evaluate what needs to be done. Think about how good the results make me feel…and this strategy leads to action and results! Step 3) Model across the steps from your own effective strategy. => As I said if it works for one aspect of your life it will work for another. The only difference is you will initially need to be more conscious about doing the strategy that you are just learning, where as the one you already excel in will happen naturally. Lets keep the time of the actionable simple and effective. Pick ONE strategy that isn’t working for you. Preferably the one which is costing you the most so far as the pain it is creating in your life and what is it causing you to miss out on. Perhaps, your eating or exercising strategy. Maybe motivation. Possibly Procrastination, Secondary Gain or Perfectionism. Finally modelling your own effective strategy. In next Friday’s show I’ll cover Part 6, Smart Simple Fat Loss: Prioritise v. Overwhelm. That’s it for another week in Healthification… next week I’ll be back and I’m going to trial 3 shows a week. My goal with Healthification was 12 months of 5 shows a week at which point I’d reassess. Well last week was week 52 and isn’t it funny how once you put something out there as an option you’ll start to find reasons to gravitate towards it? For better or worse. I think this will be for the better. I love Healthification however it’s a huge time commitment and it can get a little lonely on the other side of this microphone! So, I’m going to roll with the Monday, Wednesday and Friday format for a while and see how we go. I’ll still incorporate Tucker and Training into the shows I do. Big thanks to you for your support. I appreciate it… and I’d LOVE to hear from you.